Twenty candidates running for mayor and City Council, including all but one incumbent, told more than 500 members of COPS Metro Alliance on Sunday they support San Antonio only giving incentives to developments that include units for people making 60 percent of the area median wage. The event was billed as an accountability session where COPS Metro leaders grilled candidates with a series of neighborhood-related yes-or-no questions at St. Patrick Catholic Church in Government Hill, one of downtown’s fastest-changing communities. After the rapid-fire Q&A, each candidate was given 30 seconds for general remarks; the mayoral candidates were given one minute. COPS Metro leaders also demanded from the candidates a commitment to stay the course on a larger displacement prevention strategy, which will include freezing city property taxes for 10 years in select neighborhoods, a strategy that’s on schedule for completion this year because of recent pressure the group has put on Mayor Ron Nirenberg and the rest of City Council. It also wants city leaders to maintain more than $11 million for home rehab programs for low-income households; recommit $500,000 in a legal defense fund for U.S. born children whose parents are deported; raise the minimum wage of city contract workers to $9.50; and raise, from $2.2 million to $2.5 million annually, city funds for Project Quest, a job-training program. All candidates pledged to support all of these initiatives. The candidates who participated in Sunday’s COPS Metro session were, in order of race and alphabet: District 6 Councilman Greg Brockhouse (mayor), Mayor Ron Nirenberg; District 1 candidates Brad Kessler, Councilman Roberto Treviño, and Justin Holley; District 2 candidates Ruben I. Arciniega, Jada L. Andrews-Sullivan, Denise Gutierrez-Homer, Walter E. Perry Sr., Salena Santibanez Guipzot, Keith A. Toney; District 3 Councilwoman Rebecca Viagran; District 4 candidate Adriana Rocha Garcia; District 5 candidates Councilwoman Shirley Gonzales and Anthony Gres; District 6 candidate Melissa Cabello Havrda; District 7 Councilwoman Ana Sandoval; District 8 Councilman Manny Pelaez; District 9 Councilman John Courage; District 10 candidate Maria Perez. 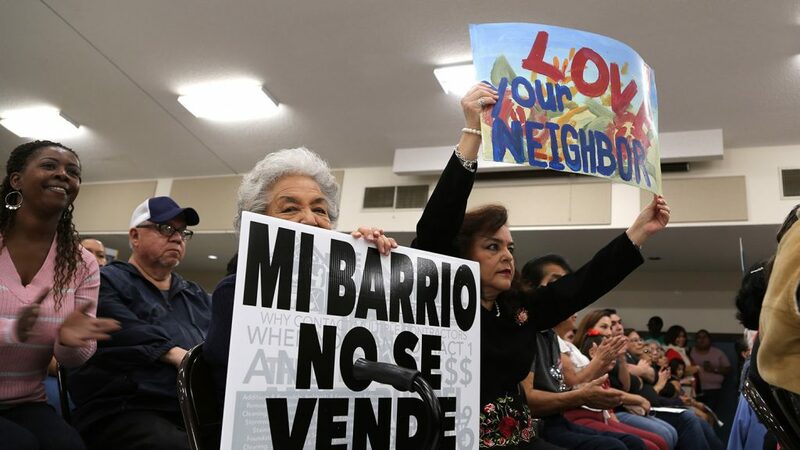 In December, the City Council reinstated the Center City Housing Incentive Policy, or CCHIP, which was suspended throughout 2018 at the order of Mayor Ron Nirenberg. His edict to city staff: Bake affordable housing into the incentive policy, which has produced primarily market-rate apartments since its inception in 2012. What resulted was a downtown housing incentive program that requires units at 60 percent of the area median income (AMI) in some situations, but not all. For example, the revised CCHIP requires 10 percent of a development’s units to be priced at 80 percent AMI, and 10 percent at 60 percent AMI, but only if the project is at or below five stories in height, and only if it’s located on the outskirts of downtown (the purple areas in first map below). Projects in these same areas taller than five stories would not require affordable units because, as city officials have explained, they require steel and concrete lattices and thus are more costly to build. In the revised policy, developments built in downtown’s core, which are generally more expensive to build because of high land costs, would also not require affordable units. 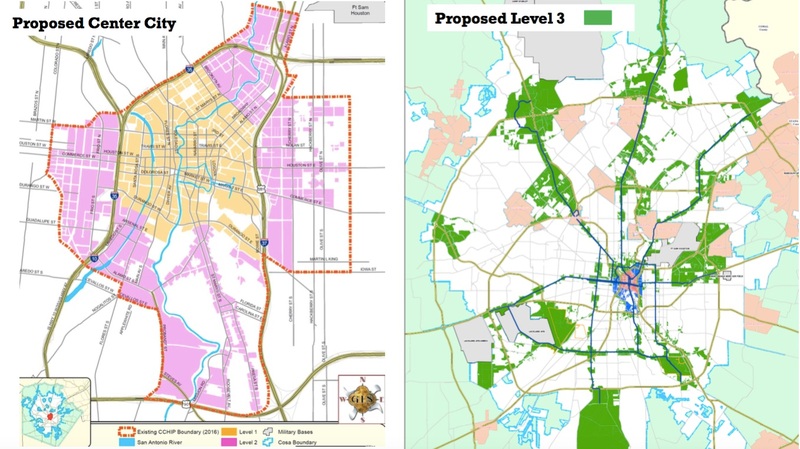 Conversely, projects outside downtown, in one of 13 regional centers outlined in the SA Tomorrow Comprehensive Plan, would required 20 percent of units priced at 60 percent AMI. COPS Metro insists any development that receive city incentives include 60 percent AMI units. In the new policy, developers receive a 75 percent rebate on the city portion of their property taxes for 15 years. The other 25 percent is captured in an affordability fund, the specific use of which has yet to be announced. The developers still pay taxes to other entities, including Bexar County, San Antonio Independent School District, and Alamo Colleges District. Also, the new policy prohibits developments that include hotel rooms from receiving incentive packages. Before the revisions were approved in December, only one development, The Arts Residences at 101 Lexington Ave., included hotel rooms. The $115 million hotel-condo project by Houston based DC partners also received the most lucrative CCHIP package worth $10 million, $9.5 million of which is what the city estimates the developer will receive in tax rebate over 15 years. In late 2017, when Nirenberg placed a moratorium on CCHIP, his decision wasn’t necessarily in response to any call to action from community organizing groups such as COPS Metro. Rather, he suspended the incentive program as his Mayor’s Housing Policy Task Force was a few months into public engagement. Since CCHIP began in 2012, the program has doled out $102 million in incentives to 64 projects, resulting in roughly 6,800 units—completed or under development. 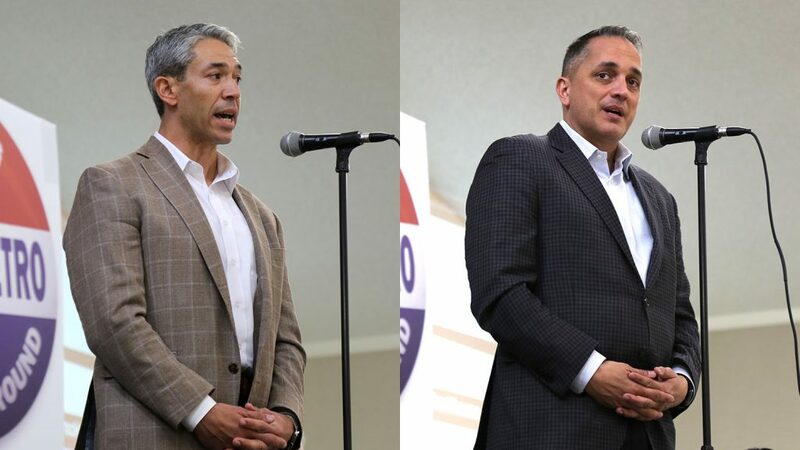 The two highest-profile candidates running for mayor, Nirenberg and Brockhouse, both spoke about preserving neighborhoods. “Since the day I got elected, the No. 1 thing I’ve been doing is fighting City Hall to make sure neighborhoods are not forgotten,” Brockhouse said. An agenda handed out at the gathering also mentions the need for 60 percent AMI units for developments of the city’s public facilities corporation and finance corporation. The San Antonio Housing Trust Public Facility Corporation (PFC) has partnered with developers on projects such as Cevallos Lofts and, most recently, The Baldwin next to St. Paul Square. The PFC agreements are based on a state law that provides a PFC-owned development a full property tax exemption in exchange for half the units priced at 80 percent AMI. Recent PFC projects, such as the 283-unit apartment complex NRP Group is building at the southwest corner of Broadway and Jones Avenue, have included units in the 60 percent AMI range. Editor’s note: COPS Metro uses a figure of $33,900 for households making 60 percent AMI, which it says it pulled from the U.S. Department of Housing and Urban Development’s website. The Heron has been calculating AMIs at different income levels based on HUD’s latest figure for a family of four, which is $66,800 for the greater San Antonio area, including New Braunfels. When you report “the program has doled out $102M in incentives”, those are potentially misleading words. At a minimum you should show the present value as opposed to the lifetime…also, you should consistently point out the abatement are on “incremental” value. Lastly, the opposite side is that we should have both a market rate program “AND” affordable programs….as opposed to an either/or strategy a both/and strategy makes more sense. I would love to meet with Father Drennen to discuss this further as I do not know him. Maybe you could connect us. Please consider running an article that outlines the city’s ROI on real estate development incentives, specifically how that money benefits families and neighborhoods long-term.